I don’t know what’s going on here, but sure, why not? After all, isn’t The Talk basically a more drunk The View? Or a less drunk Fourth Hour of Today Show? Regardless, here’s the Kristin Chenoweth and the ladies of The Talk taking out their hair extensions because nobody updated her firmware and Chenbot’s gone rogue! If nothing else, Donnie Osmond looks super sad he couldn’t join in on the fun. Next time, Donnie Osmond. 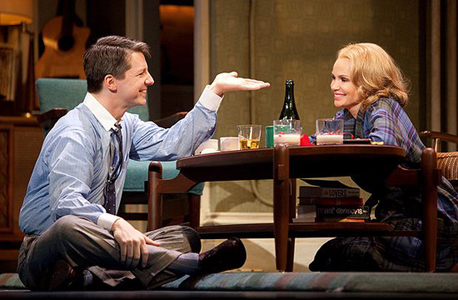 Remember that one time we all got to talking about how Newsweek‘s very own Ramin Setoodeh got to talking about how Sean Hayes is too gay to function play straight opposite Kristin Chenoweth in the Broadway revival of Promises, Promises? The folks over at Slant Magazine‘s blog, The House Next Door, were kind enough to let me get up on my big, gay soap box (it’s a lil’ bit bedazzled, quelle surprise) and share my thoughts about Ramin Setoodeh’s recent Sean-Hayes-is-too-gay-for-a-Broadway-musical-co-starring-Kristin-Chenoweth debacle, so if you’ve ever wondered what I’m like when I haven’t chased a handful of crazy pills with a double shot of espresso, you can check out the piece here. Maybe it’s just me, but that’s sorta like inviting a foul-mouthed drag queen to a black tie event. Enjoy!